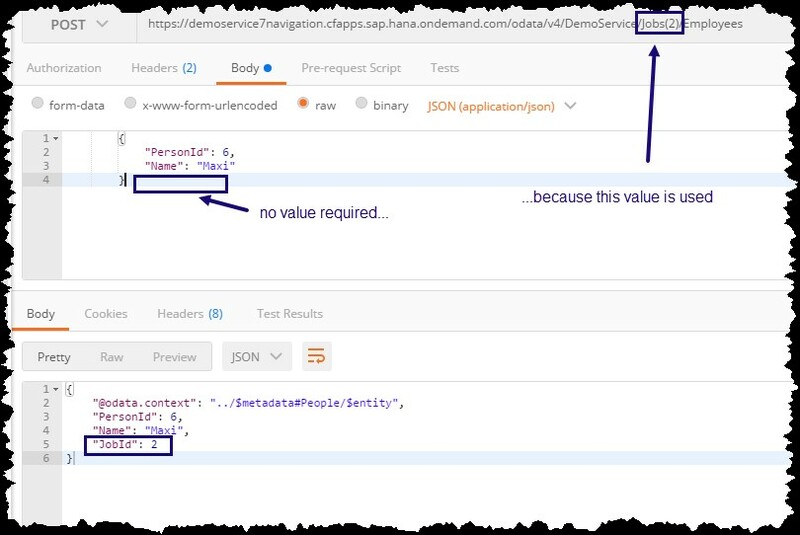 In the previous blog we’ve learned how to define and implement navigation between 2 entities in an OData V4 service, based on the SAP Cloud Platform SDK for service development. In our example, we can navigate from one job to all people who have this job. The fwk supports $expand in a generic way, no additional code is required on top of what we already have done. If you don’t like reading, just scroll down to the end of this page to view the full source code. Nothing new with respect to OData and edmx. See here for how to create a project. We can reuse the same edmx file which we were using in the previous blog. First of all, we can reuse the same java file which we were using in the previous blog. OK, now that you’ve copied the java file, let’s add the required code. This is a bit special case in the navigation. As you’ve realized, when navigating from a job to the assigned people, we end up in a list. This is somehow a list. I mean it: it is a list. It is still a list, because we’ve modeled it like this. So, if it is really a list… why not address a single entry of the list? Just like we do for a normal READ? And NOW, we can also do a READ for exactly THAT list of People which we get when following the navigation. With other words: there’s a list of people who all have the same job. Now we want to READ only one Person of this list. You might wonder why this is done at all. We could similarly retrieve this person from the person-collection and applying a filter, etc. Yes, it is true, often there are several ways of achieving the desired goal. However, small differences can be in the way how a service is used and in performance considerations. Imagine a smartphone app which has strong requirements to limit the network traffic, so going through the flow, navigate from one screen to the next and only then a small amount of data is fetched by the underlying OData service. What does that mean implementation-wise? Step 1: We first need to get the list of people who have the chosen job. Step 2: get the requested person from the URL. Note that we don’t search in the list of all existing people. We have to search in the temporary list which we’ve filled in step 1. Once we’ve found it, we can return it. What if the user specifies a key which is valid, but not true? Implement a CREATE operation and take the source entity into account. so why not use THIS collection? The code for CREATE on a navigation property is almost the same like for a normal CREATE. As such, the user of our service can remove this property from the request payload, when doing a POST request. But even if it is present in the request payload, we have to ignore it in our implementation. Now coming to the implementation. Because we have to set is in the response body. Why this cannot be done by the FWK? Because in this special case, the real response is different from the data which is sent in the request body, so the FWK cannot know. That’s it about coding for this tutorial. The following topics don’t require any implementation. You might have heard about this OData feature. It is like a READ request and a navigation within one call, and the data is all visible in the response payload. It is easier to understand when looking at examples. And you may just go ahead and try it out. Of course, there are valid concerns about performance. A manual implementation can be and should be more efficient than the generic FWK support. We have the list of Jobs, like we get when invoking a normal QUERY. 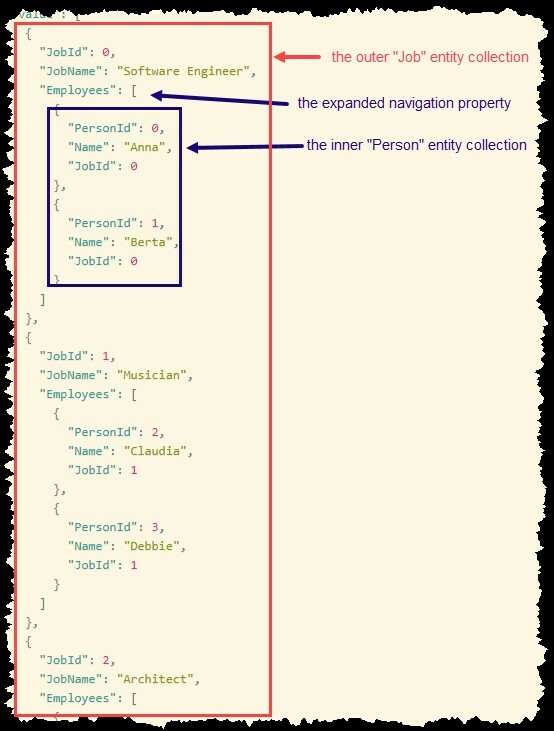 But in addition, for each entry the navigation property (“Employees”) is rendered. Furthermore, the value of the navigation property is rendered. It is the same like when following the navigation property in the previous calls. How to compose that URL for expand? The name of the navigation property is just the same like you were using for the “normal” navigation. You’re wondering: what is the FWK doing? How can it do the expand? Is there some black magic happening…? Don’t worry, the FWK is just a human, like us. What it does, when an expand is detected, the FWK calls our implementation for the “normal” QUERY (or: READ) and for each (or: the) entry, it follows the navigation property and calls our implementation for it. You’re wondering: urgh – is that efficient…? In this case it is us who need to decide if we can afford to rely on the FWK-functionality. Of course, such generic support cannot be performant. But for small amount of data it is just nice to get it for free. Stay tuned to learn how to overwrite such generic FWK-functionality with own specific implementation. For this chapter we don’t need much explanation. What we’re learning here is that the result of a navigation can be treated like a “normal” entity collection or a “normal” single resource. As such, we can apply system query options. Again, like in “normal” QUERY, we don’t need any manual implementation. This call combines just a $select and $expand. There’s nothing strange about it. However, maybe you’re wondering because you might have expected that only those properties can be expanded, which are contained in the $select statement. // Navigation from one job to all people who have this job. // CREATE on a navigation property.